On the heels of the third installment of the “100 Year Anniversary of the 1917 Revolution” lecture series, hosted by the NYU Jordan Center and co-sponsored by the NYU Department of History, we reproduce last week’s NYU News interview with Jordan Center Director and Professor of Politics Joshua Tucker, conducted by Niv M. Sultan. One hundred years ago, the Russian Revolution overthrew the Russian Empire, ending nearly two centuries of monarchic rule. You might remember, from one history class or another, that the shake-up came in two parts: The February Revolution (March on the Gregorian calendar) forced Czar Nicholas II to abdicate his throne, and then the October Revolution (November on the Gregorian calendar) led to the Russian Civil War, from which Vladimir Lenin and the Bolsheviks emerged victorious. Crucially, it was the triumph of the Red Army in the Russian Civil War that laid the foundation for the creation of the Soviet Union in 1922. And although the USSR would dissolve within nearly 70 years, the state and its citizens produced numerous scientific and cultural touchstones—the Sputnik 1 satellite, the novel Doctor Zhivago, and the video game sensation Tetris, to name a few—plus a Cold War with the democratic West that shaped global politics for half a century. So great was the Soviet Union’s outsize impact over the course of its brief life that its downfall led to debate over what to expect in a world without it. To mark the 100th anniversary of the Russian Revolution, NYU News spoke with Tucker about communism’s legacy and how the Soviet Union changed the world. You write that “Soviet communism was arguably history’s greatest experiment in trying to reorganize the fundamental tenets of political, economic, and social life in a radical fashion.” What was so ambitious about it? To take a theory of how society should be organized—in pursuit of this greater good that was said to be the scientifically determined ultimate evolution of human existence—and to implement that, was really an enormous experiment. Collectivization of agriculture, nationalization of all property, reorganization of how people undergo economic activity—this was all incredibly dramatic activity. Moreover, the ruling Communist Party was a model of the single-party state, where a party that claimed to be pursuing utopia on Earth would have carte blanche to decide what sort of behavior was and was not to be tolerated in society. But over time this involved collectivization decisions that led to the deaths of millions of people, and devastating violent purges that took place in the name of the greater good of communism. Did people generally think that Soviet communism would last for the long haul? Or did it seem doomed from the start? For many people, there was no sense that it was ever going to come to an end—the end was actually quite surprising. And unlike some other experiments—like Pol Pot in Cambodia, for example—this one lasted for a very long time. We’re talking about 70 years of exposure in the former Soviet Union, and even 40 years in East-Central Europe. In theory, it was a massive attempt to make the world a better place, and it ended up having all these incredible effects on the people who lived through it. What happened when the Soviet Union dissolved? 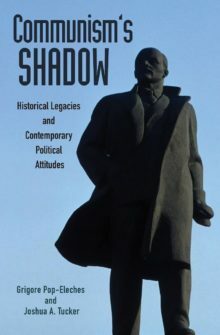 Our thinking going into this book was that communism’s legacy had come to be thought of as more of a residual variable—where when you had something you couldn’t explain, you’d just say, “Well, it’s because of the communist legacy.” We wanted to bring the communist legacy front and center. You looked at people’s attitudes toward four concepts relevant to Marxist-Leninist theory: democracy, markets, state-provided social welfare, and social equality (in the form of gender equality). What did you find? We found that there was less support for democracy and markets, and more support for state-provided social welfare, among post-communist citizens as compared to citizens in the rest of the world. However, we got very different results for gender equality than for the other areas. We actually did not find a gap with post-communist citizens being more supportive of gender equality than citizens in the rest of the world. If anything, in some instances and specifications, we found them less supportive of gender equality. Do you have theories about why the support for gender equality lagged behind the other categories? One possible explanation is that it may have been that on the other three issues, communist regimes walked the walk in addition to talking the talk. They really were single-party states, the state really was heavily involved in the economy, and there really was free health care and education. But despite a lot of the lip service, in many ways these societies did not come close to approximating real gender equality. One thing in favor of this theory is that we found that the more years you spent as a child under communism, the more likely you were to support gender equality. And if you think about it, one place where the communist regimes did act on their commitment to gender equality was in fully integrating girls into the school system. So, if there was one place you might have expected to see an effect from walking the walk on gender equality, it would be when people were younger, and in the schools. How have communist-influenced political attitudes affected transitions to democracy in post-communist countries? There’s this giant puzzle of why countries like Poland and Hungary—which had seemed firmly in the camp of consolidated democracies—have experienced backsliding toward authoritarianism. Some believe that East European countries may have been “democracies without the democrats”—that while they were very procedurally democratic, and while they followed all the instructions to get into the European Union, the population maybe hadn’t bought into democracy. If that’s the case, studying how communism has influenced individual political attitudes could help explain why. But I’m not convinced that’s the case. For example, 10 years ago we thought that Romania was wavering in its democratic commitment—but now it seems to have a strong commitment to democracy. So I think there’s always a danger of being myopic in the moment. You start each chapter in the book with a communist joke. Why? I wrote this book with Grigore Pop-Eleches, a close friend of mine who grew up in Ceausescu’s Romania, and there’s a whole subfield about humor as a coping strategy under communism. Throughout the time that we were working on this, we’d be talking about something and Grigore would say, “You know what? That reminds me of a joke.” At some point I said, “I bet we could find a joke that links up with every single one of these chapters.” I’m especially proud that we were able to come up with a joke that worked for the statistics and methods chapter. That was particularly challenging! But if I wanted to be more philosophical and high-minded about it, I might say that this is about communist-era legacies, so it’s a way of sharing a little bit of the communist experience with the reader. Do you think that there’s potential for your work to inform contemporary American relations with post-communist countries? I’d like to hope so. It can’t hurt, when you are trying to carry out diplomacy with partners from other countries, to have a better understanding of what their societies are generally like. I think it can provide the nuance for people to understand a bit more about why citizens in these countries might have slightly different attitudes. And it may also help them understand distinctions among opinions within the countries.